South Africa is a country of well-known promise and peril. Despite being the largest economy on the African continent, the nation is plagued by high levels of unemployment, a poor education system and staggering income inequality. Underscoring the country’s struggle to translate its rich natural resources and other assets into social benefit, South Africa ranked 149th out of 162 in its ability to convert wealth into well-being, according to a recent assessment by Boston Consulting Group. While financial inclusion – the adoption, usage and sustainability of financial services – is generally linked to socioeconomic development, it faces numerous challenges in South Africa. BCG recently carried out research into the state of financial inclusion in the country, which revealed some of the key reasons why South Africans are not big on banks. 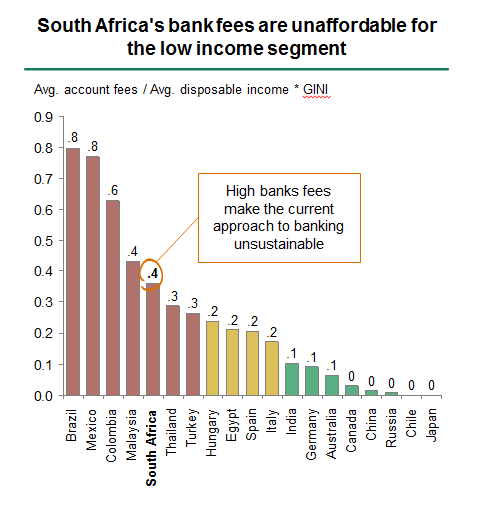 The fee structure of South African banks is up to four times higher than countries such as Germany, Australia and even India. However, this is partly due to the high operating costs of banks and the proliferation of cybercrime. In 2015, cybercrime cost South African businesses approximately R5.8 billion ($450 million), and while all businesses have taken proactive measures to combat this threat, banks spend three times as much on IT security as non-financial organizations of the same size. Notwithstanding that more than 70% of adults have transaction accounts, only 24% make more than three monthly transactions such as withdrawals, deposits or card swipes. Many people are willing to run the risk of loss and theft associated with cash to avoid the fees, resulting in more than 60% of all purchases being paid for in cash. People on low incomes have a deep mistrust of the formal financial sector, which is rooted in fears of exploitation. Past abuses, such as the inappropriate marketing and selling of financial products, have shown that poor people are highly susceptible to rapacious commercial interests. For example, South Africa recently started paying social grants directly into bank accounts, which prompted financial institutions to target grant recipients with products such as funeral coverage and micro-loans, whose costs were automatically deducted from the recipients’ accounts. Many grant recipients were left with very little to survive on, causing a public outrage and subsequent investigation into the legality of the financial institutions’ activities. South Africa’s poor are particularly vulnerable due to widespread financial illiteracy, exacerbating the sense of mistrust and levels of exploitation fostered by these practices. Unfortunately, this is a systemic education problem within South Africa that cannot be addressed in the short-term. 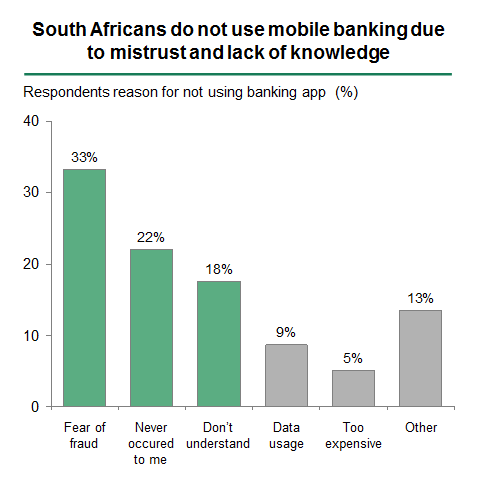 While some people in the low-income bracket do not utilise mobile and internet banking simply due to lack of familiarity, the fear of fraud involving ATMs and mobile/internet banking was cited as the number one reason for preferring to transact in cash. This group also expressed a preference for transacting face-to-face because in the event of any issues they feel there is better chance for recourse, versus using digital technology. More than 40% of South African households use trust-based models such as “stokvels”, according to the National Stokvel Association of South Africa. A stokvel is a savings or investment society in which members regularly contribute an agreed amount which is then divided amongst them, according to the method agreed by the members. For many South Africans, stokvels are more than a mechanism to save money – they provide a safety net for emergencies and offer an aspect of social interaction for the purpose of entertainment or advice. Especially for the lower-income population, community-based organizations such as these still provide the flexibility and support structure that is perceived as lacking in the banking industry. The financial services industry has created substantial barriers for individuals to access products such as loans. Banks require payslips and bank statements, and approval can take a long time. This is restrictive to people in the low income segment that often need money on the same day and do not have access to these documents. When borrowing money to get to work or buy food, flexibility and near immediate response times are the key factors in determining the channel used. Despite the progress that has been made by formal financial institutions in these areas, regulatory requirements make it difficult for them to compete and therefore, in a pinch, many South Africans turn to community loan sharks (known as mashonisas), or friends and family. According to the last survey conducted by Statistics South Africa in 2013, more than 1.5 million people were running small, informal businesses in the country. These informal businesses do not easily satisfy the requirements of the formal financial sector. Banks require proper registration in order to open business banking accounts and offer loans, but registration fees are often prohibitively expensive for small business owners, limiting the use of such services by these businesses. Bringing more people into the financial system has the ability to enhance GDP growth, reduce poverty and create new market opportunities for the private sector. Achieving financial inclusion is therefore a critical milestone on the path towards realising the promise of the Rainbow Nation. 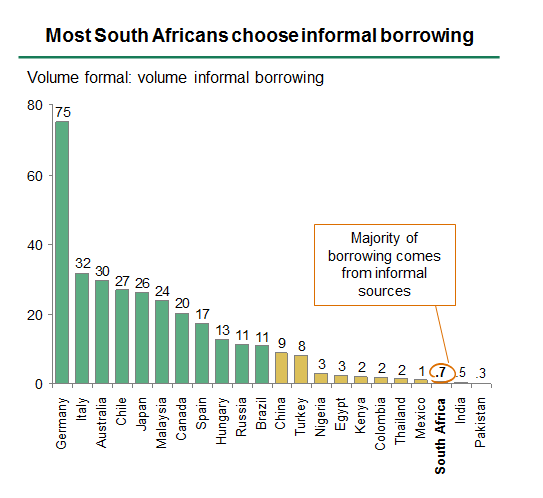 However, a more innovative approach to financial inclusion is required in South Africa. While regulation by the government can act as a catalyst, financial institutions will need to work together with the public and private sectors. At the same time, stakeholders need to understand the preferences and unmet needs of consumers, as well as the barriers they perceive in accessing financial services. Importantly, digital technology is not a silver bullet; many different levers need to be pulled to achieve this goal.